Carl Bray and Ann Japenga at Gramma's restaurant in Banning. Photo by by Kim Housken. You go down into what they call the Checkerboard country, Carl says, and there’s a trading post there called Counselor’s, named for a Kentucky-born pelt trader. Carl and his late wife Luella often traveled to Navajo country with their church group and Carl did odd jobs for the families on the reservation. His “honey do” list had him driving around on unmarked roads in a big old Chrysler with air let out of the tires for desert driving. He was often lost. Knowing Brownie was looking for Indians to paint, Carl once said: “Come with me out to Checkerboard country.” There Brownie found his muse. His mystical, almost psychedelic paintings of Navajo Indians draped with turquoise now sell for more than a home in the suburbs. Sitting here talking to Carl I learn how the Coachella Valley painters went back and forth to Navajo country; while some of the Santa Fe and Taos painters also came back and forth to the Coachella Valley. Painters were always drifting between the distinctly different deserts. One month it was the land of mesas and buttes, the next the Valley of dunes and smoketrees. Carl had a gallery in Taos for 40 years, spending summers there and winters running his gallery in Indian Wells. The Indian Wells gallery still stands —but barely. The City of Indian Wells has been working overtime to tear down this roadside landmark on Highway 111. Carl and I continue our conversation on long drives to a little apple pie place in the mountains above Banning. He likes to go to lunch at a favorite café where he used to go with Luella. With a friend at the wheel, I’m squished in back with Carl and the other passengers, leaning one way and another on the turns. The art talk rotates with train talk. Carl tells us how to get a train up the infamous Beaumont Pass (it’s nothing to have ten helper engines), then shares the fact that the painter Fred Penney cooked up weenies in his VW camper on paint-outs to feed the starving artists. From talking to Carl, the picture that emerges is of a great brotherhood (and occasionally a sisterhood), a bohemian enclave, a rich roiling cast of landscape painters in the Coachella Valley, the big names all connected through a complex genealogy. Most of them were of modest means or downright poor. Bill Bender camped under an Ironwood tree where the Living Desert is today; his dinner was a bag of grapefruit. Some of the others sold their art on the roadside out of trucks that doubled as homes. I first learned of Carl– like so many others—from the palette-shaped sign outside his roadside home and gallery on Highway 111: “Painter of the Smoketree”. While Indian Wells once revolved around a date shop, a snake barker, a House of Purple Glass and other humble attractions, Carl’s home and gallery is today the last remaining scrap of the original village that would morph into one of America’s glitziest resorts. One day years ago I stopped in at Carl’s gallery and agonized over whether to drop $100 for a painting. I’ve never regretted the purchase. Bray’s paintings are bold and full of a special language—the language of Carl. Railroads strain (don’t say “chug”; the railroad guys hate that) through outsized passes, with no other hints of civilization. Just a hardworking engine, a line of track, open desert and a smoke tree—that’s it. The colors are sometimes childlike and wistful. Collector Allan Seymour says Carl’s folk sensibility has earned him the status of a Grandma Moses of the desert. His style is seemingly uninfluenced by trends or other artists, though Carl did know many of the big names: Maynard Dixon, John Hilton, Marjorie Reed, Sam Hyde Harris and others. In his private vocabulary, messages come up canyons to show you the way. I have a painting of his, “Voices Up the Canyon”, in which a Navajo girl sits on horseback near dark, waiting for a message telling her which way to go. You know the answer will come. In Carl Bray’s world, there’s always a right way to go. As I get to know Carl, I find he does live in a world of distinct messages and clear right and wrong, all influenced by his religious upbringing. He and Luella sang in their church choir; and he loves to point out his church on those drives to Oak Glen. Once I asked him if he was troubled by the possible demolition of the Indian Wells home he built by hand. “I’ve got higher things on my mind,” he said. Carl Glen Bray was born in the Ozarks, and never lost his slight Okie inflection and warm country manner. Add a turquoise bolo tie and other Taos touches, and you have an amalgam style. The first thing you notice when you meet him is his massive Casey Jones hands, and his wry wit. He tests a stranger right off to see if he can joke with you; after that you’re good friends. He came to Indio in 1936 and got a job on the Southern Pacific railroad, working as a switchman, brakeman, herder (the man who links and uncouples engines) and just about every other thing. He started painting on the job. Somewhere there are Carl Bray sketches on boxcars and even on switch shanties along the line. His son, Patrick, also a railroad man, tells me those shanties have probably been hauled off or demolished, but if anyone has an old switch shanty adorned with an original Carl Bray in their garden–please get in touch. Around 1940 he was working on a railroad bridge along the track in Mecca when he saw a scrawny painter sketching outside a small shack. He had heard the name—Maynard Dixon. Shyly, the fledgling painter Carl introduced himself. Dixon’s advice to the wet-behind-the-ear’s artist? “Get out of this business while you can.” Dixon only stayed in the place called Desert Camp or Desert Kitchen briefly, but he painted some well-known scenes there such as “Destination Unknown”. The obscure railroad siding by the Salton Sea took on an aura of painterly magic, becoming a place of pilgrimage for many artists—for reasons no one has quite figured out. Fred Grayson Sayre lived there and his landlady accepted his paintings in exchange for rent. The writer Ed Ainsworth (author of the pivotal book “Painters of the Desert”) later bought a place there, and Bill Bender, John Hilton and others of the Smoketree School all hung out. Carl and Luella bought a plot of land along the highway in Indian Wells in 1953 for $1,000. He built his home there, reinforcing the pumice stone walls with discarded steel from the Indio railyard and hauling in stones from Berdoo canyon for the two-sided fireplace. He and Luella raised four kids in that home, with the spirits of Kavinish keeping them company out back. Kavinish was a major Indian Village, home of the famous walk-in Indian Wells. The Bray kids were always finding little arrowheads and piece of pottery in the yard. Carl sold the gallery in 1999 and moved to Banning. Despite the city’s fervent efforts to tear his down his homeplace, it has hung on thanks to the Indian Wells Historic Preservation Foundation and devoted locals. It stands as a true monument to the Smoketree artists. It was right here, for instance, that Fred Chisnall came to die of a broken heart. Like Carl, Fred found something magical in the Indian Wells cove by Point Happy. He was always looking for the stagecoach loot hidden in the jagged hills. When Carl and Luella took him in, he’d been living on carrots and sleeping in the back of his truck, paintings tucked around him. They nursed him in his sickness; and he died in their upstairs room. For generations of travelers, their first exposure to the beauties of a desert painting (or the desert itself) came on a stop at Carl’s highway gallery. The painter was something of a stand-up comic and entertainer; he liked to paint out front with a crowd around him. He’d paint a scene upside down and see if anyone noticed, or crack jokes about how he painted with a palette knife–“the trowel and error” method. Carl was always known as painter of smoketrees—it said so on his gallery sign–and in fact all the desert painters painted this scrubby bush, nondescript most times of the year, except when it erupts in gorgeous indigo blooms. Just as the coastal painters of Laguna became known as the “Eucalyptus School” the desert painters were the Smoketree School. Driving home from lunch I think about how much I owe to this man. He is my window to the desert artists and he’s taught me a lot about family, painters and trains. May your influence live on, Carl. Thanks for giving me a peek at a lost bohemia, and pointing out that the smoketree looks like people dancing—with a halo. I found 3 of Carl’s paintings in an auction, 2 of them are 16 x 20 and one is 24 x 36. Thank you for the great article. We drive past the studio in Indian Wells on our way to La Quinta where we have two of Carl’s paintings. I just rescued a third today from a thrift store, a landscape with trees, not a desert scene like our others but I have already found a perfect spot to hang it. What a great story! Our family and the Brays have been friends for sixty years or so, but in recent years (since my dad died) I’ve lost touch. Thanks for a great interview with one of my favorite guys in the world. He’ll always be “Uncle Carl” to me. When Pat and I were kids, we’d sleep on a mattress on top of the well house in Indian Wells. Hot, but great fun! We have five Bray paintings here in Albuquerque and I treasure them. I’m actually his great grandson! I have lived here in the Coachella Valley since 1955. I have a painting that Carl Bray did in December 1957 of the Indian Wells Desert. It is 32 x 40 and in the original frame. It is absolutely beautiful and I remember well when Indian Wells was not much more than desert. It will be quite sad when the house and gallery are gone. I would like to talk with anyone who has a Carl Bray painting. Kathy, I would like to meet you and see your painting. Lynn, where did you find your painting? MAX, can I meet with you to find out more on your GGF? Please call ASAP. I am doing a story on the Bray home demolition today Friday 11-19, 2010. Great reading ! My father Genbe Chism and Carl were classmates for several years at Colcord (Ok) High..graduated together in ’35, part of the “Dirty Dozen” as they called themselves. I have known Carl myself since the mid 1960’s, as Carl and Luella always stopped off at Mom and Dad’s to spend a day or two in transit between Desert Wells and Taos..Louella had the most beautiful collection of Squash Blossom jewelry. He gave my folks and my siblings each one of his big paintings..I have two of his paintings, and one real original…a sketch of a locomotive and the Southern Pacific Logo on a styrofoam cup, while we sat and had coffee one morning at my folks table. They are a sweet couple, and I was sorry to see Louells pass..I am glad Carl is still with us. My dad would also be 93 right now had he not passed away in 96.. I have an original Carl G. Bray oil painting. It is a Mediterranean landscape with sig in lower left corner. Looks similar to his desert landscapes. Is anyone interested in this piece of art? I plan to add a section to this website where readers can post questions such as yours with photos of their paintings. Stay tuned. Thanks for your note, which I passed on to Carl via old-fashioned mail. I’d love to see that styrofoam cup-painting someday! Hi, Ann!! Shoot me an Email, and I can send you pictures of MY pictures!. I have 2 paintings, and several “views” of my fantastic styrofoam cup..Definitely a CGB original. heehee ! I am a second cousin to Carl. My mother, her five sisters and one brother were first cousins and grew up together in Oklahoma with my mother being the same age as Carl although she passed away in 1959. I met Carl for the first time in March, 2010 and was so glad to meet him after hearing about him all my life. I have inherited three of his painting through the years, all of them being painted at least 50 years ago since I got them from my mother and aunts. My wife and I truely enjoyed our visit with Carl and wish him well for may years to come. What a beautiful article. Carl is my Grandfather (one of Patrick’s daughters). He still lives in Banning and still enjoys painting. I loved reading this! I also know how much all your kind words mean to him. Carl passed away Saturday July 23rd, 2011 from heart complications. He will be greatly missed by all. 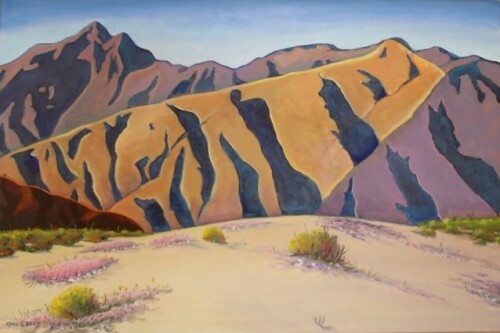 I have a 48″ x 24″ painting that Carl did of a huge Southern Pacific Daylight 4412 train barrelling through the desert with a smoke tree in the lower right just above his signature. I visited the Indian Wells studio in 1975 and purchased the painting. If someone would like to see a picture of this painting, please let me know. Thanks. By the way, nice story Ann. I thoroughly enjoyed the article on Carl. He and my father, Eugene Chism graduated from Colcord High School together. (I see that my brother, Steve, has posted some comments as well.) I just was thinking of Carl and Luella this morning and Googled his name. I was so sad to see that he had passed away this past July. When I was married in l970 he and Luella gave me a large, framed desert painting, and I have and always will , treasure it. Just last Saturday I was visiting my brother in Reno and he showed me his Carl Bray paintings that were hanging in his new home. He and Luella were the Salt of the Earth. A lovely, Christian couple who treasured each other, their family and friends, and most of all, loved their Lord and Savior, Jesus Christ. After reading the above posts and seeing interest in Carl Bray paintings I thought I would share. I have an exquisite smokey desert landscape titled “Full Moon”. It has well taken care of and was among a private collection of vintage 1930’s paintings. Should anyone have interest in this painting, I am interested in selling. I have two Carl Bray originals in good condition. They are 24×36 and are in the original frames. They hung in my grandparent house for years and have fond memory’s. If you’re still around Carl, Bob and Flo Meister loved them!! We knew Carl and Louella back in the 80’s here in Taos NM. We attended the same church, in Canon NM. I bought a small painting from Carl of a desert scene, signed in lower left corner and he signed the back: C. Bray 10-5-83 to “Effie”. It is good to see something here on the internet about him and his art work. I gratefully own one of Carl’s oils. It was given to me by my parents who met him in Toas, NM and struck up a friendship. I remember going to his studio there in Toas and throughly enjoying taking in the whole artsy feel of the place. My parents Lew and Pearl Ingwaldson have some of his desertscapes but mine is a winter scene with a bright red barn and lots of blue snow, I just love it. I think I do because it’s such a unique piece and not his typical style as well as it just draws you in, the sled full of passengers arriving on the cold winters evening to a warm yellow farm home. The hues are rich and deep yet warm and inviting. I was so grateful to run across your article and find out more about him and where his life has taken him. I have several Carl Bray original paintings (2 large ones of Indian girls, and 4 smaller ones of desert landscapes) that were my husband’s grandfather’s, who has passed away. What is the value of these paintings? Hello, I lived in the Little mom and pop Indian wells store and gas station on hwy 11 in the 50’s next to carl Brays house and studio,I have three of his smoketree paintings that I bought many years later…Whenever I felt blue I would go and park by his studio and nearby was an old fireplace that still stood with no house. Indian wells is beautiful now but it doesn’t look like it did in the 50’s. I remember the purple glass house with all its bottles and the famous house on the hill that they finally tore down, and of couse his home..There is a sadness that it is all gone now..
What a thrill to hear from someone who actually lived in the old Indian Wells village, now completely erased by the City fathers (and mothers). I still look toward the site of Carl’s house every time I drive down 111, and like you it makes me sad every time to realize it’s all gone. We have very few photos of the old Village so please send some if you have any. In 2007 I purchased a thoroughbred horse painting done by Carl. Each time I look at it, I see the most awesome horse. My grandparents Harry&Agnes Whittlesey owned the trailer and cabin village on the east side of Carls place. My mother still has many old pictures, postcards of the place. Also have what I believe is one of Carls pictures, Its of Charlie Carr the pistol totin fellow they called the mayor. Anyone with info on it or him would be appreciated. I just bought a Carl Bray painting tonight at a significant art auction here in Santa Fe New Mexico. A wonderful desert painting. There were two paintings for sale. I have a painting by Carl Bray. A 38in x 26in oil on canvas with a large ornate wood frame. The painting is a lake scene with a background containing several mountains and forest under a beautiful blue cloud filled sky. The foreground contains what appears to be an aspen tree. Possible the painting is of mountain scenery around Taos. The painting was given to me by Angie Garber several years ago. As a boy, I knew Angie who worked with my parents at the Navajo Mission at Counselors, N.M. in the 50s and early 60’s. I also have a large signed print (“Waiting For A Ride” of Navajo women and children) painted by R. Brownell McGrew done in honor of Angie for her work among the Navajo. I never knew the connection between McGrew and Carl Bray until I read this article and so now the puzzel pieces are falling into place. He probably met Angie on one of his trips to Counselors and the neighboring Navajo Mission. I would have enjoyed meeting Carl. Thanks for the education. I recently bought a home in Rancho Mirage. It was abandoned for close to 10 years and needs everything from sewer pipes to electrical wiring. It has a rich history and great bones. I am working diligently to restore it. When I am frustrated I take my truck and go to thrift shops looking for good desert art. I have several beautiful paintings by well known desert painters. Including a painting by Carl Bray. I have fallen madly in love with the desert. Thank You for this wonderful slice of history regarding such a dear man and an incredible Smoke Tree painter. His paintings leave me inspired. Hello, I have 8 Carl G. Bray paintings which I would now like to sell; can anyone point me in the direction of a good online auction or studio to contact to sell these paintings? I just purchased 2 (perhaps atypical) small paintings of Carl Bray – small florals! I know they are originals because the family had a winter home in Palm Desert area. Carl was my mothers cousin. I have three of Carl’s original paintings that I would be willing to sell. If interested call me at 479-372-3914 for more information.